Blues Are Back…In the Western Mail! Humour has always played a big part in my writing. When I was writing poetry, I was probably most influenced by other Cardiff poets like Topher Mills, Ifor Thomas and Peter Finch, and one of the main reasons was not just that they were Welsh, but that they all made me laugh. On our first date, my girlfriend spent about 5 minutes telling me this awful joke, and I think I admired her for having the audacity to do that, and fortunately I’ve discovered since that she is genuinely a very funny person. The humour in football to a large extent comes from fans in the stands of the stadium. The expression used these days might be “banter”, but I suppose it’s the clever chants that people can come up with, and if you then hear a couple of thousand people singing this, it can be quite entertaining. It’s sad that these days, so many chants used by clubs are very generic, and are essentially the same from one club to the next, but every club will have at least a few unique chants, and it’s the humorous ones that are always my favourites. The piece of writing that I sent to Parthian Books before being commissioned to write “The Blues Are Back in Town” was titled “The Sad Crew”, and to some extent the idea was that this was kind of a parody of the best-selling book about the Soul Crew. That’s not to say I didn’t enjoy the Soul Crew book, and I’ve got a lot of respect for its author, Tony Rivers, who I’m quite friendly with. 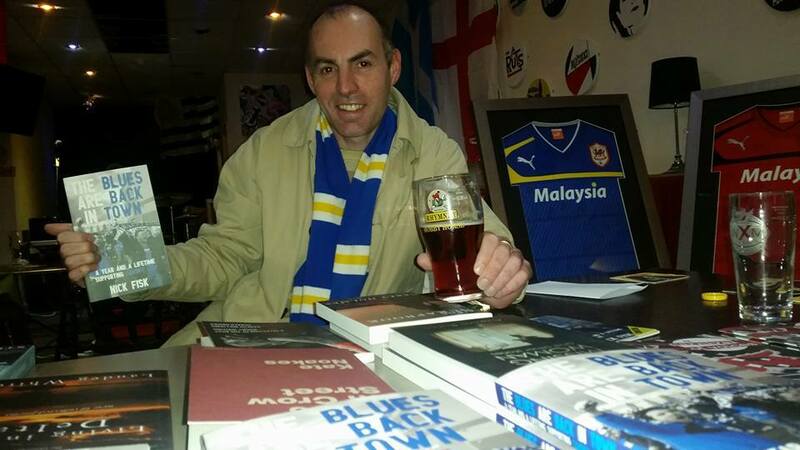 He is a genuinely passionate football fan, and in many ways, he did a lot of Cardiff fans a big favour in releasing that book – the exposure given to the hooligan element of Cardiff City I think enabled fans to be more honest about their support for the club. But I liked the idea that there were a lot of “ordinary” fans that also needed exposing, and I saw myself as being amongst this group. Maybe people needed a book from a fan that is not just about all the fights they’ve been involved in, and besides, I could hardly write about the football-related fights I’ve been in, because I have hardly been in any! There had been talk on messageboards, jokingly I think, that maybe it was about time the book about the “ordinary” fan came out. Ironically, calls for this book were led by Gwyn Davies, himself the author of the book about a group of Cardiff fans known as the Valley Rams, and someone who had inadvertently become something of a hate figure among many fans due to his support of the rebrand. Without doubt, Cardiff’s support has changed in recent years, so that we are now regularly picking up awards for being the best family-orientated club. This is not something a lot of fans like to hear, and a lot of people will say that our support has become a bit boring. But there are still hundreds of fans, old and new, who are enjoying supporting the club they love – you can’t deny them that support, whether it’s in the manner that older fans are accustomed to or not. I think we’re all working towards trying to re-instill a more passionate form of support. We worked together to get our colours restored, and that worked out. Cardiff are not doing so well on the pitch at the moment, but still, the job of the fans that are sticking by the club must be to generate more atmosphere so that the match day experience is something that everyone enjoys. The club also needs to work with fans I think to assist in this, instead of making fans’ lives a misery, which sadly is the role some of the stewards seem to take on. It’s come a bit late in my life, but I’m really thankful to Parthian for giving me the opportunity to continue writing as some form of career – there are more potential books in the pipeline. When I was a lot younger, I had ambitions to be a journalist, possibly a music journalist, as music was my biggest passion when I was a student. I still write occasional gig reviews for the website Louderthanwar, run by the former NME journalist, John Robb. I generally try to make reviews more personal, so that readers get more of a feel for the actual experience, rather than just an account of how the band sounded. In the old days, people who would try to get in to gigs for free were known as blaggers. These days, we’re known as bloggers. I guess there’s not too much difference between a blogger and a blagger!